Stock returns are positive for several weeks before "unexpected" expansionary monetary policy announcements. Studies of the effects on asset prices of U.S. Federal Open Market Committee (FOMC) policy decisions often focus on narrow event windows of 30 to 60 minutes around the time decisions are announced. In Monetary Momentum (NBER Working Paper No. 24748), Andreas Neuhierl and Michael Weber suggest that such a narrow focus may underestimate the effect of monetary policy. They show that asset prices change for as long as 25 days before and 15 days after officially announced policy changes, even when by some measures the policy changes appear to be unexpected. The researchers defined a monetary policy surprise, or "shock," as a policy announcement for which the FOMC announced a rate that was lower or higher than the rate that had been predicted by federal funds futures contracts prior to the FOMC meeting. There were 137 FOMC meetings during the 1994-2009 sample period and eight inter-meeting policy announcements. 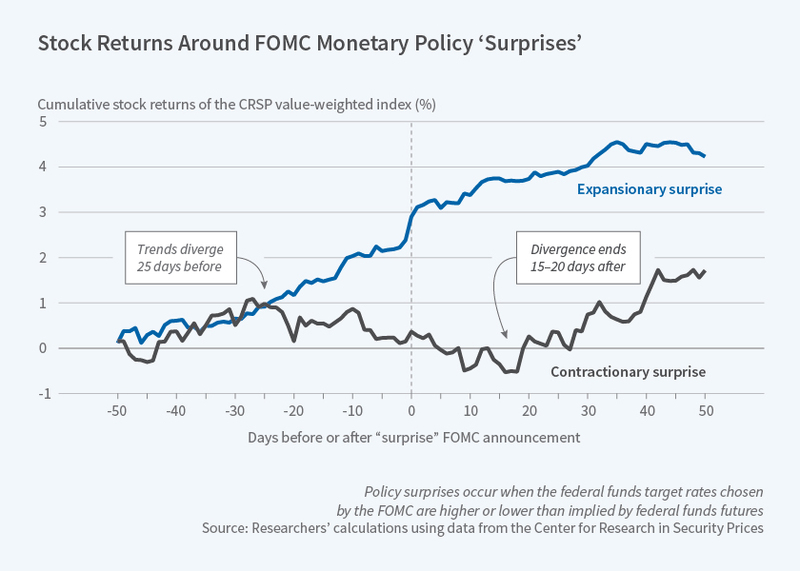 The average monetary policy surprise was zero. The largest unexpected interest rate cut was more than 45 basis points and the largest unpredicted increase about 16 basis points. Using excess returns data from the Center for Research in Security Prices value-weighted stock price index, the researchers found positive returns as much as 25 days before expansionary monetary policy shocks. Returns were slightly negative, or indistinguishable from zero, before contractionary shocks. Returns were positive on the days before both types of announcements. While returns continued to be positive after an expansionary announcement, contractionary announcements were followed by negative or zero returns for the next 20 days. The cumulative difference in the return drift between expansionary and contractionary announcements was about 4.5 percent. The drift in stock prices in the month or so around "surprise" FOMC announcements affected firms in almost all industries and extended to many equity markets outside of the United States. The abnormal returns tended to be in the same direction for cross-sectional return premia such as size, value, profitability, or investment. Around contractionary policy shocks, loser stocks tended to plummet, creating potential returns for momentum investment strategies. A monetary momentum strategy invests in the market when a monetary policy shock is expansionary, and shorts it when the shock is contractionary. To test whether there are trading strategies that could profitably exploit the observed differences in stock returns around these shocks, the researchers compared Sharpe ratios for a buy-and-hold strategy and a monetary momentum strategy for various event windows around the FOMC meetings. The Sharpe ratio measures portfolio reward per unit of portfolio risk. Buying-and-holding the market throughout the year produced an annualized Sharpe ratio of 0.31. After adding a monetary momentum strategy of shorting the market for 15 days following any contractionary monetary policy shock to the buy-and-hold strategy, the annualized Sharpe ratio increased to 0.46. The researchers found that monetary momentum was economically different from time-series momentum, which they define as a strategy of investing in the market 15 days before an FOMC meeting whenever the stock market had positive excess returns over the preceding 12 months, and shorting the market when the market's excess return was negative. The researchers conclude that what have to date been considered surprise changes in target FOMC interest rates might be partially predictable, a fact that would have "...important implications for the large literature in macroeconomics and monetary economics that tries to understand the real effects of exogenous monetary policy shocks on real consumption, investment, and GDP."